One of the country’s finest music dealers is preparing to host Gretsch Day, a star-studded event where attendees will indulge in all things Gretsch. The event will take place on June 18 at noon at Street Sounds in Brooklyn, N.Y., where guests will participate in giveaways, raffles and a presentation given by Fred Gretsch and Gretsch product specialist Joe Carducci. Other big names in attendance include Gretsch artist Paul Pigat, who will perform and talk about the great Gretsch sound, and the lovely Kim Falcon, who will be present to sign posters and take photographs. One of the highlights of the event includes the Gretsch tribute to George Harrison exhibit, which features a G6128T-GH George Harrison Custom Shop Tribute Duo Jet™ Guitar and exclusive memorabilia. 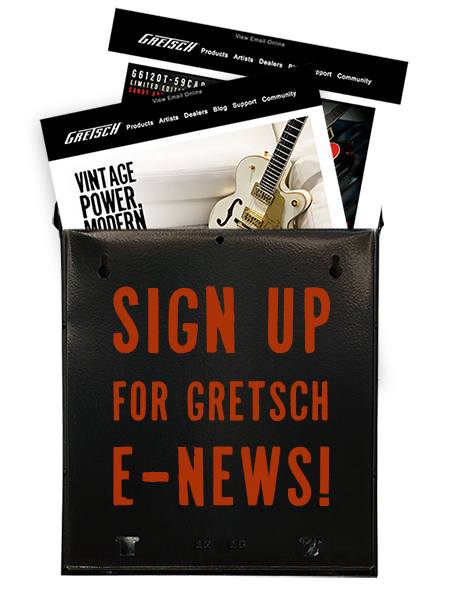 Afterwards, Fred Gretsch will be giving a walking tour of the original Gretsch factories in nearby Williamsburg. This event is free of cost. For details on the location, visit Street Sounds’ Facebook page here.